It always feels to me that the week leading into a break; fall, spring or summer, feels hectic and chaotic and stressful.! As swim season gears up and extra-curriculum activities get moving for all our school children (that count is now 3/5). This week is no exception for us, after school meetings, swim practice and HOMECOMING at my school are all happening this week! Our house is only getting busier!!! Today was day 2 of my daughter's swim meet, my son had Hebrew class at religious school and due to the rainy weather here, my daughters had limited play space at the swim meet. But, as a testament to what an amazing community our swim family is; my girls got in plenty of indoor and outdoor supervised play time because they are loved by sooo many people. I'm so grateful for all of those men and women. Sunday: We're headed to my uncle's house for dinner. We get to hear all about how my brother is doing and China! Tuesday: We have a busy night tonite so we're grilling chicken breasts and hot dogs, making potatoe wedges and Country Salad. Thursday: This is the homecoming game for my high school, which means we are tailgating with the faculty and their families! Favorite tailgating recipe is homemade corn dip. What's your favorite homemade tailgate recipe? Make sure to share it in the comments below! Friday we are having dinner out with my parents since they're going to be in town! First time in a while! And another night with no dishes!!! Saturday: (Happy fall break!!!) I'm hoping to start getting some yard work done today, which means I'm planning a make-up on the grilled Brauts and veggies. If you had yours, maybe tonite is the night to try grilled cheeseLTs? 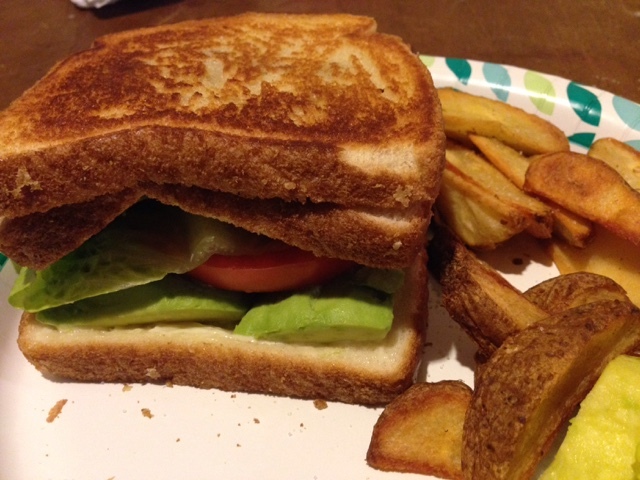 It's a grilled cheese with bacon and an extra piece of bread to dress the BLT part! A bit much, but so tasty! We had ours with homemade potato wedges. Here's the grocery list for your shopping! And best wishes to you all for a great fall break! May it be restful and useful and everything you and your family needed!